Aural rehabilitation is the process of identifying and diagnosing a hearing loss, providing therapy to clients, and implementing amplification devices to aid the client’s hearing abilities. The goal is the habilitation or rehabilitation of persons to overcome the difficulty caused by a hearing impairment or deafness. Aural rehabilitation is frequently used as an integral component in the overall management of individuals with hearing loss and refers to services and procedures for facilitating adequate receptive and expressive communication in individuals with hearing differences. Aural rehabilitation is often an interdisciplinary endeavor involving physicians, audiologists and speech-language pathologists. Audiologists and speech-language pathologists are professionals who typically provide aural rehabilitation components. The audiologist may be responsible for the fitting, dispensing and management of a hearing device, counseling the client about his or her hearing loss, the application of certain processes to enhance communication, and the skills training regarding environmental modifications which will facilitate the development of receptive and expressive communication. The speech-language pathologist is typically responsible for evaluating the client’s receptive and expressive communication skills and providing the services to anchor improvement. The speech-language pathologist also provides training and treatment for communication strategies, speech-perception training, speech and voice production, and comprehension of oral, written, and sign language. Often with children, aural rehabilitation services would more appropriately be called "habilitative" rather than "rehabilitative." "Rehabilitation" focuses on restoring a skill that is lost. In children, a skill may not be there in the first place, so it has to be taught -- hence, the services would be "habilitative," not "rehabilitative." Specific services for children depend on individual needs as dictated by the current age of the child; the age of onset of the hearing loss; the age at which the hearing loss was discovered; the severity of the hearing loss; the type of hearing loss; the extent of hearing loss; and the age at which amplification was introduced. The aural rehabilitation plan is also influenced by the communication mode the child is using. Examples of communication modes are auditory-oral, American Sign Language, total communication, Cued speech, and manually coded English. The most debilitating consequence of onset of hearing loss in childhood is its disruption to learning speech and language. The combination of early detection and early use of amplification has been shown to have a dramatically positive effect on the language acquisition abilities of a child with hearing loss. In fact, infants identified with a hearing loss by 6 months can be expected to attain language development on a par with hearing peers. Managing hearing aids and assistive listening devices. Because children are fitted with hearing aids at young ages, early care and adjustment is done by family members and/or caregivers. It is important for children to participate in hearing aid care and management as much as possible. As they grow and develop, the goal is for their own adjustment, cleaning, and troubleshooting of the hearing aid and, ultimately, taking over responsibility for making appointments with service providers. Training in auditory perception. This includes activities to increase awareness of sound, identify sounds, tell the difference between sounds (sound discrimination), and attach meaning to sounds. 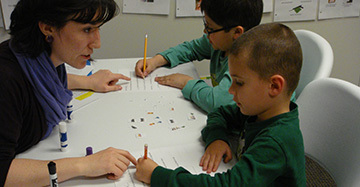 Ultimately, this training increases the child's ability to distinguish one word from another using any remaining hearing. Auditory perception also includes developing skills in hearing with hearing aids and assistive listening devices and how to handle easy and difficult listening situations. Using visual cues. This goes beyond distinguishing sounds and words on the lips. It involves using all kinds of visual cues that give meaning to a message such as the speaker's facial expression, body language, and the context and environment in which the communication is taking place. Improving speech. This involves skill development in production of speech sounds (by themselves, in words, and in conversation), voice quality, speaking rate, breath control, loudness, and speech rhythms. Developing language. This involves developing language understanding (reception) and language usage (expression) according to developmental expectations. It is a complex process involving concepts, vocabulary, word knowledge, use in different social situations, narrative skills, expression through writing, understanding rules of grammar, and so on. Managing communication. This involves the child's understanding the hearing loss, developing assertiveness skills to use in different listening situations, handling communication breakdowns, and modifying situations to make communication easier. If you are an adult, aural/audiologic rehabilitation services will focus on adjusting to your hearing loss, making the best use of your hearing aids, exploring assistive devices that might help, managing conversations, and taking charge of your communication. Services can be individual, in small groups, or a combination of both. Your hearing loss. It is important to understand your specific hearing loss. Sometimes it takes several discussions with your audiologist and with your family for things to "click." By better understanding your hearing loss, you will gain new insights into why you think people are mumbling, why you "hear" but cannot "understand," why you have difficulty with female voices, and the other questions you have been asking yourself for so long. Your family's understanding of your hearing loss. Your family does not know how you hear. What they do know is that you do not hear well! They know they use lots of energy trying to communicate with you. Sometimes, the audiologist will play a recording that simulates your hearing loss so that your family can understand better what you are going through. Your hearing aid. What will your hearing aid do and what will it not do? When you have realistic expectations, it is easier to adjust to your hearing aid. Also, your audiologist should review how to take care of your aid, how to troubleshoot problems, and answer any of your questions. So much information is given to you at the time of the hearing aid fitting that it is difficult to absorb everything. Also, as you use your aid, more questions will come to mind. This review also helps family members understand that your hearing aid was a prescription for you. Often, well-meaning family members and friends keep bringing you ads for other kinds of hearing aids or talk about other friends who have "better" hearing aids because they do not understand that your hearing aid was chosen because it met the needs of your hearing loss and your common communication situations. Assistive listening devices. A hearing aid won't wake you up when you are sleeping. A hearing aid may not help you in a theater. But, there are many other devices that can help, such as TV listening devices, personal FM systems to use in lectures, conference microphones, and telephone amplifiers. You can become acquainted with these devices and see how they can improve your social, family, and work life. Learning to listen again. Even if you don't have hearing aids but have discovered that you have a hearing loss, aural rehabilitation services can give you strategies to improve listening and increase your communication effectiveness. If you do have new hearing aids or a cochlear implant, your world will be full of sounds you forgot existed. You will be moving from what has become a quiet world back to the normally noisy world in which we all live. Through training and practice, you will acquire new listening habits. Using visual clues. Everyone uses their eyes to get clues about what people are saying, their mood, their interest in the topic of conversation, and so on. You probably are using your eyes even more to make up for what you cannot hear. Speechreading training provides formal instruction in how speech sounds are made, which sounds look alike on the lips. Learning which words have the same mouth movement but very different meaning can be incredibly useful in increasing understanding of conversations. You can also gain a great deal of helpful information from following other visual clues like facial expression, gestures, body movement, and body language. For example, if you are not sure what was said, facial expression may help you figure out whether the speaker said "I'm mad" or "I'm sad." Broader observation of factors like the physical environment, the context of the conversation, and the people involved is also helpful in gaining information about what was said or what might likely be said next. Handling conversation. By learning to take charge of your communication assertively (not aggressively! ), you can become a more effective communicator. There are may ways to be assertive. You can ask people to get your attention before speaking to you, suggest that they face you, and ask them not to shout. Another way to be assertive is to learn and use strategies for handling communication breakdowns. Know when to ask for a "rephrase" instead of a "repeat", know how to apply a clarification strategy, and learn how to ask questions. Arrangement of your home. Now that you've learned more about your hearing loss, you may want to rearrange your furniture to promote easier conversation (and that full-face view mentioned above). You might wish to change lighting so you can better see your conversation partner's face. Perhaps carpeting can be strategically placed to absorb noise. Maybe there are alerting devices that can help you identify when the doorbell rings. Dealing with background noise outside the home. In a noisy restaurant, for example, request a table further away from the kitchen and clattering dishes. Seat yourself directly in front of your dining companion so that you can maximize your understanding of conversation. Support groups. You are not the only one with a hearing loss. Joining a support group will give you the opportunity to learn from others' experiences. How do they handle traveling, meetings, appointments, going to the hospital, telephone conversations, hearing in theaters, difficult family members or work associates? Have they used assistive listening devices? What has worked? Support groups are excellent forums for problem solving and mutual support. They are also good for your sense of humor - an essential ingredient for coping with a hearing loss! Your legal rights. Today there are laws such as the Americans with Disabilities Act that provide for accommodations for people with hearing loss in the workplace and in public meeting places like hospitals, courtrooms, and places of worship.